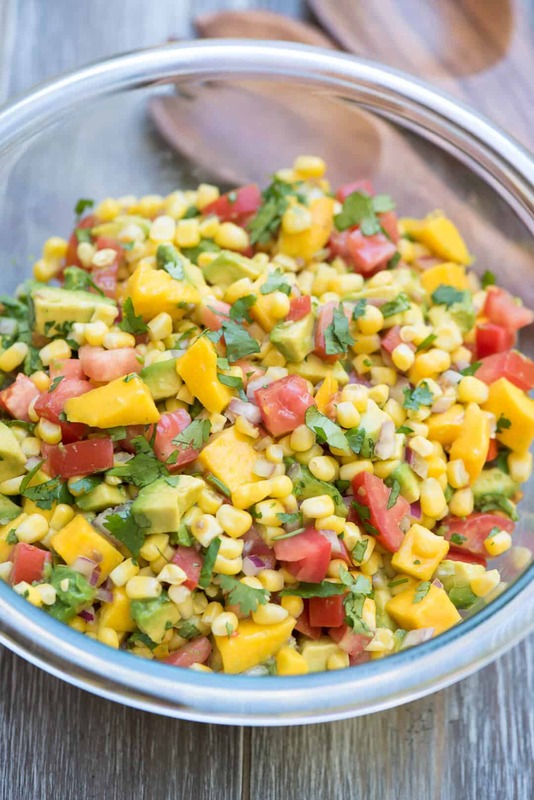 This bright and fresh Mango Avocado Corn Salsa will make a gorgeous addition to your next summer menu. Set it out with a bowl of tortilla chips or spoon it over grilled chicken, steak, or fish for an unforgettable meal. When I start to see those wonderful yellow skinned champagne mangoes piling up in the produce section I know it’s time to get them while the gettin’ is good. They are incredibly sweet and I think the flavor is more delicious than any other variety of mango. 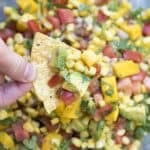 Some of my favorite ways to use them are in my Mango Corn Salsa with Black Beans, Chicken Tacos with Mango Avocado Salsa, crisp and refreshing Mango Cucumber Salsa and this delicious Mango Corn Avocado Salsa I’m sharing with you today. 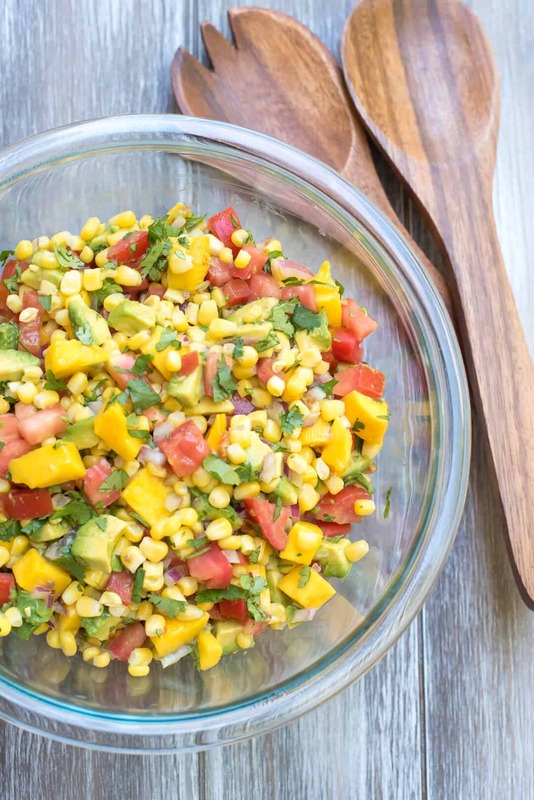 Everything about this salsa screams summer and it will add a happy seasonal vibe to your next BBQ. 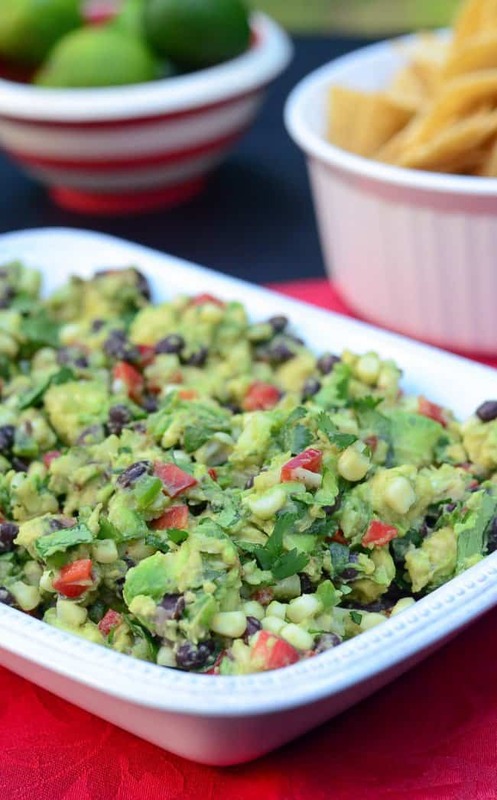 It’s completely irresistible as a chip dip but I love it most spoon over grilled chicken or steak. I could also happily wrap it in toasted tortillas with grilled shrimp or my Blackened Mahi Mahi. 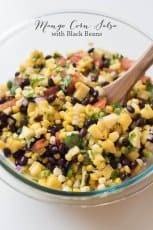 The fresh, sweet flavor of this salsa is the perfect complement to my Chipotle Maple Grilled Chicken. 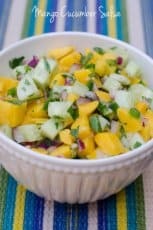 Champagne mangoes are sweeter and less fibrous than other varieties and just perfect for salsas and salads. They’re ripe and ready to use when they are golden yellow in color and soft when squeezed gently. Check out this article for easy slicing instructions. If you purchase mangoes that are too firm to use immediately they will be awesome in time. Just let them sit on your kitchen counter for a day or two. Use them right away or refrigerate your fully ripened mangoes until you’re ready to use them to avoid letting them get too soft. To help firmer mangoes ripen more quickly, place them in a paper bag and leave them on your kitchen counter overnight or for as long as needed to reach the desired ripeness. 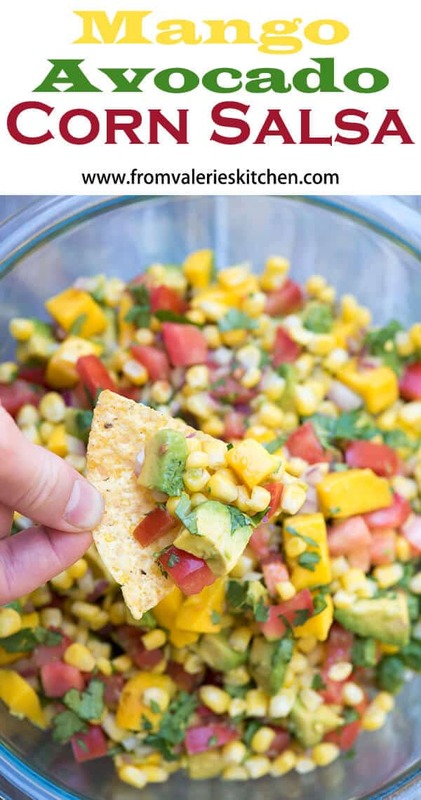 To make this even more effective, add an avocado to the bag with the mangoes. Both mangoes and avocados release ethylene which helps speed up the ripening process. I mixed up a simple dressing of rice vinegar, olive oil, lime juice, and a touch of salt. 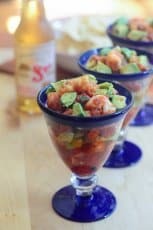 The lime helps to keep the avocado from browning so the salsa can be prepared an hour or two in advance. It’s best eaten within a few hours which is not a problem in this house! Transfer the frozen corn to a colander and place it in the sink. Rinse the corn with cold water for a couple of minutes, tossing with your hands occasionally to break it up. Continue rinsing and tossing until the corn is thawed. Drain well. If using fresh corn remove the husks and silks and use a sharp knife to slice the corn from the cob. 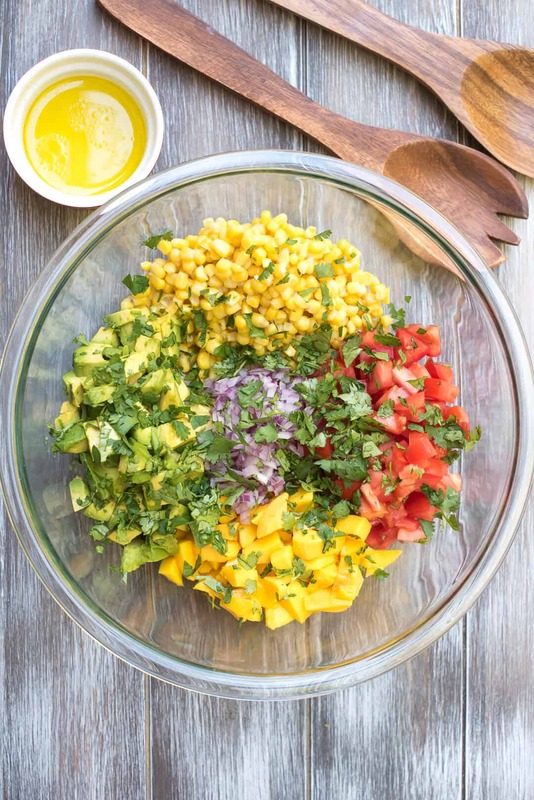 Add the corn, tomatoes, mangoes, avocados, red onion, jalapeno (if using) and cilantro to a large mixing bowl. Set aside. In a separate small bowl combine the rice vinegar, olive oil, lime juice, and a touch of sea salt. 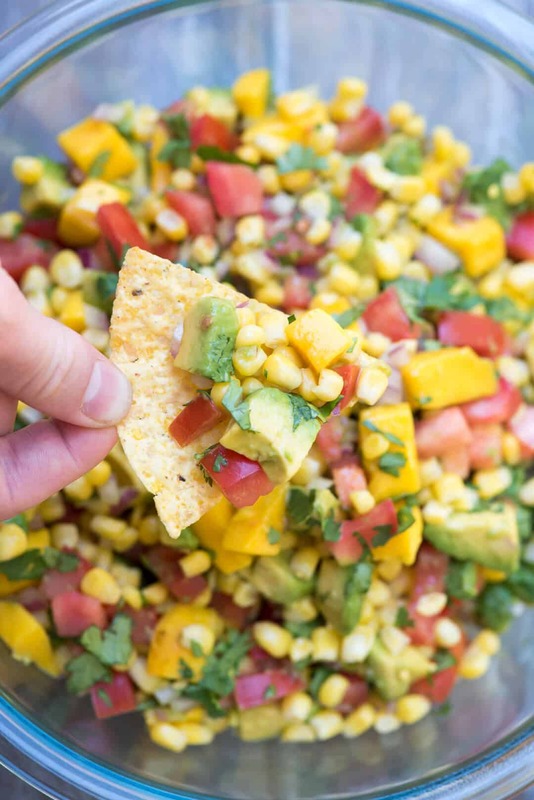 Pour the dressing over the salsa and toss lightly to avoid bruising the avocado. Serve immediately or cover tightly with plastic wrap and refrigerate. It's best if served within an hour or two. When I make this recipe to serve along with something that already has some heat to it like my Blackened Mahi Mahi or Chipotle Maple Grilled Chicken I will leave out the optional jalapeno. It is delicious either way!